Structure: Balance, alignment and optimum biomechanics of your skeletal system is essential for movement and full expression of life. Life is movement! Emotions: Our emotional health affects our attitude, our relationships and our ability to interpret the world. Overlook this and life is reduced to mere existence. 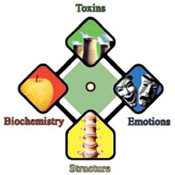 Toxins: We live in an increasingly polluted environment. The air we breathe and the water we drink lack the healthful properties that our grandparents enjoyed. Biochemistry: Today’s produce are often devoid of essential vitamins and minerals because they are grown in depleted soils using artificial fertilizers.